Opening Reception, Dec 9, 7-10pm. Abstract painter and sculptor Bill Porteous finds great inspiration in music. Born into a musical family (his father was a drummer) Porteous excelled at percussion as a youth, later taking up the trumpet. Today, the artist uses the language of music to arrange and title the patterns of organic energy that comprise his paintings and sculpture. He often uses offbeat, jazz-like syncopations in his painterly expressions of colour, shape, texture and form. Now seventy, Porteous is a mature, confident painter. “Get clear, get empty” sums up his East/West philosophy embodied in the concept of Wu Wei. This mental discipline allows our actions to be effortlessly aligned with the flow of life energy or chi. ​“I consider art to be a force of nature,” he says, “art pre-exists us and keeps on flowing.” Drawing from an infinite pool of possibilities, the artist prefers to focus on certain facets. As a curious observer of life, Porteous draws imagery from an internal storehouse of memories and associations. While painting, he navigates between the polarities of order and chaos with a series of intuitive and counter-intuitive marks. “As soon as I make an initial gesture,” he says, “I know another balancing stroke will follow.” Surprises and chance encounters surface in his paintings as the visual dance unfolds. ​​D’AMBROSIO architecture and urbanism is an award-winning practice active in Victoria since 1991. Located at the Selkirk Waterfront, the firm specializes in mixed-use and green initiatives such as 2950 Jutland Road and the Atrium at 800 Yates. In 1993, Franc D’Ambrosio met Porteous at an exhibition and purchased two of his abstractions. The men kept in touch, and their professional relationship grew. When ground floor space became available in the architect’s mixed-use buildings, Porteous and his studio/gallery would move in. The artists would enlivened the empty space rent-free courtesy of Jawl Properties. After tenants were found, Porteous would relocate, cheerfully moving his creative energy and community connections to a new locale. 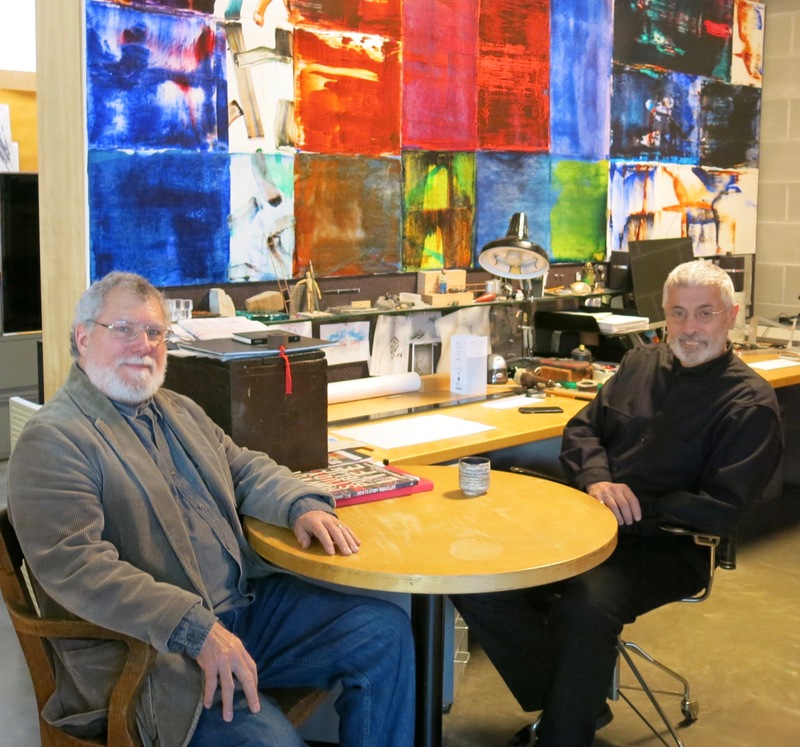 Bill Porteous (left) and Franc D’Ambrosio at the architect’s office. Emerging Sphere is a seven-story stainless steel sculpture in a stairwell of 2950 Jutland Road. Emerging Sphere has steel shapes ranging in size from 18-48 inches in diameter. As new projects evolved, Porteous was commissioned to add a fine art component at the blueprint and model level. Corporations like Jawl Properties include the cost of public art in their construction budgets. 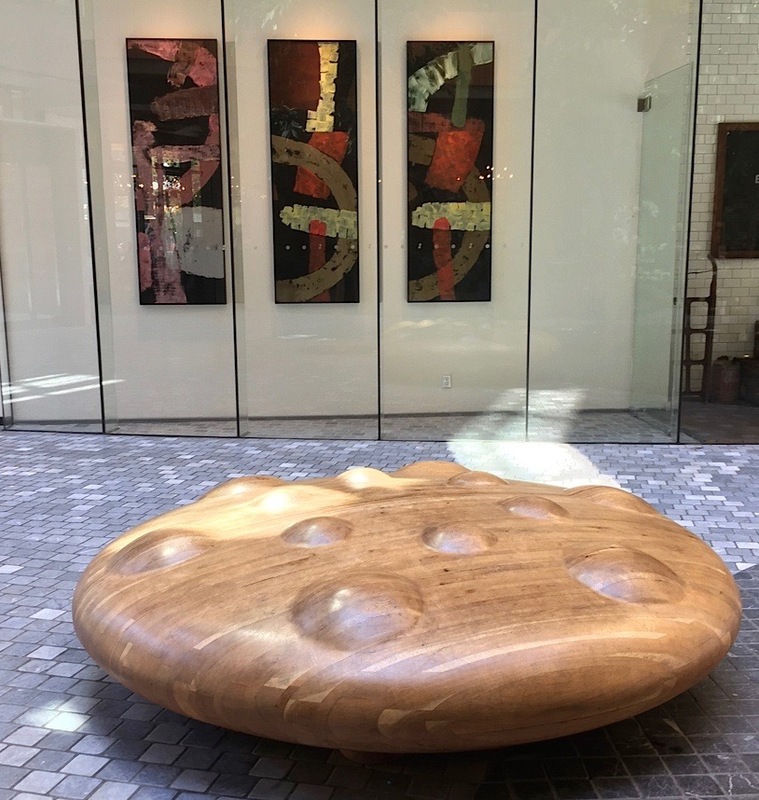 “Architecture is an artform,” says D’Ambrosio, “dialoging with artists during design allows creative ideas to unfold.” He believes the aesthetic of fine art adds sensory pleasure, richness and resonance to the surrounding structures. 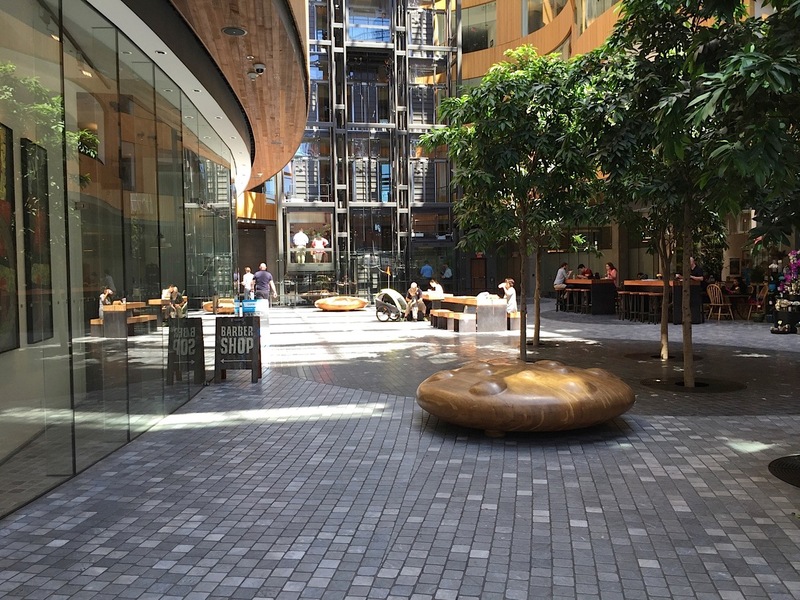 Creating functional and elegant buildings brings a vibrant energy to downtown Victoria. Wu Li Painting installation in the Gatehouse building at Selkirk Waterfront. 2000. Acrylic paint on 12 canvas panels, each 4 x 6.5 feet. During construction of the Atrium (Yates and Blanchard), Porteous helped design a large red box enclosure to hide the site office, machinery and fencing called Hoarding panels. The 5000 square feet of abstract painting that decorated the Hoarding was later segmented and used inside the Atrium. This unique idea gave visual appeal to an unsightly construction area. Mosaic floor in Atrium. Gary Oak Disk in foreground and Maple Disk in the background. Gary Oak Disc and paintings from the Coda Paintings constructed from selected sections of the Prelude Hoarding panels. Opening reception, Dec 2, 7-10pm. ​Opening Reception Dec 15, 7-10pm.